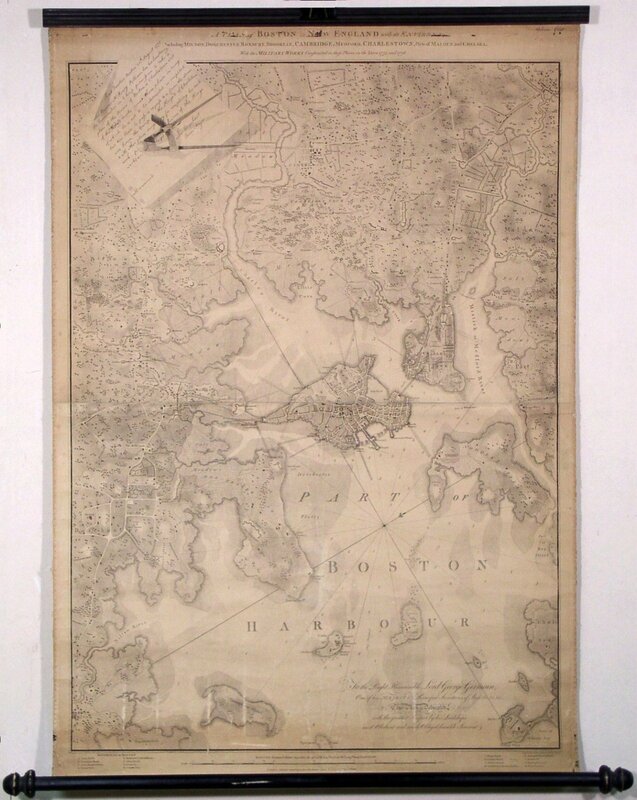 Henry Pelham (mapmaker) / Francis Jukes (engraver), A PLAN of BOSTON in NEW ENGLAND with its ENVIRONS, / Including MILTON, DORCHESTER, ROXBURY, BROOKLIN, CAMBRIDGE, MEDFORD, CHARLESTOWN, Parts of MALDEN and CHELSEA. / with the MILITARY WORKS Constructed in those Places in the Years 1775. and 1776., London, June 2, 1777. Aquatint and line engraving on two sheets joined. 38.5"h x 27.5"w plus title, legend and margins; uncolored. Backed on early linen with 19th-century rollers. 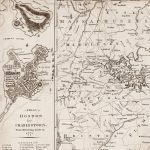 For its combination of importance, beauty and rarity, Pelham’s Plan of Boston is the most desirable printed map of the Revolution in New England and the most desirable map of Boston ever printed. In excellent condition and with provenance in the same family for two centuries, the example here offered can hardly be improved upon. Following the events at Lexington and Concord on April 19, 1775 General Gage’s army and its Loyalist supporters were besieged in Boston by a makeshift but very large American force. Among the Loyalists was Henry Pelham (1749-1806), son of well-known mezzotint artist Peter Pelham and the half-brother of painter John Singleton Copley. A professional artist himself, trained at least in part by Copley, Pelham’s many surviving letters reveal him to be an intelligent, compassionate man, deeply loyal to friends, family and the idea of the British Empire. With his portraiture business moribund, he seems to have undertaken mapmaking as a source of income. His first project was a plan of Charlestown depicting the Battle of Bunker Hill and the fortifications built thereafter by the British, along with an accompanying view of the town. He hoped to send the draft to Copley in the Summer of 1775 for publication in London. Whether Pelham did in fact send the manuscript to Copley or carried it with him when he left Boston in March is unclear. 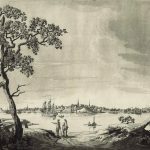 Either way, A Plan of Boston in New England was reproduced in aquatint by Francis Jukes and published in London on June 2, 1777. The result is one of the most stunning cartographic documents of the Revolution. Pelham’s plan takes in not only the Shawmut Peninsula but Charlestown, Cambridge, Brookline, Roxbury, Dorchester and parts of other towns. The plan carefully depicts the street plans of Boston, Charlestown and Cambridge-in fact, it is one of the very few plans of either of the latter two towns printed during the Revolution. A legend at the base of the map uses an alphabetical key to identify 16 important locations within Boston itself, including the State House, Governors House, and Faneuil Hall. The North-at-right orientation is unusual, and the vertical layout coupled with the tonal variations cause the surrounding areas somehow to loom threateningly over Boston proper… perhaps an echo of Pelham’s own experiences during the siege. 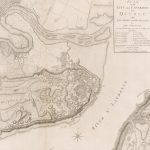 The great historical value of the plan comes from its careful depiction of the many fortifications thrown up in and around Boston in 1775-76. Clearly shown is the ring of batteries with interlocking fields of fire emplaced by the Americans around the city, strengthened by a number of forts placed on advantageous high points. Most interesting perhaps are the “new works” shown on Dorchester Heights. Put in place overnight on March 4-5, 1776, these gave the Americans artillery command of the sea approaches to Boston and completed the isolation of the city. On March 17 the British and their American sympathizers-Pelham seemingly included-evacuated to Halifax, Nova Scotia. While much credit is due to Pelham’s artistry, the map’s visual appeal is greatly enhanced by Jukes’ use of the aquatint process. For this technique, the plate is covered with a granular ground or resin and “bitten” with acid as in an etching. The image is produced by protecting certain areas of the plate from the acid with an impervious varnish, by multiple bitings to produce different degrees of darkness, and by the use of several different resins with different grains. The method permitted Jukes an immense range of tonal variation, which contrasts pleasingly with the line-engraved elements and imparts to the map an unusual degree of texture and depth. The example offered here has resided in the same family for two centuries or more and must be considered a hitherto unknown impression. The recto bears the ownership inscription of “Ephraim Eliot,” a prominent Boston druggist in the 19th century and a direct-line ancestor of the recent owner, who possesses a number of other Elliot artifacts. The verso bears the inscription of George Russell Lincoln, another family ancestor. A letter from the present owner describing the discovery and family history of the map will be provided on request. WorldCat lists examples at the Cornell and Library of Congress. Boston Engineering Department adds complete examples at the British Museum, Harvard, the Essex Institute (now the Peabody Essex Museum), and the Edward Bangs collection (current location unknown). Also mentioned are partial copies (i.e., top or bottom sheet only) at other locations. Examples also reside at the American Antiquarian Society, Boston Public Library, New York Public Library, and Norman Leventhal Collection in Boston, and Yale University (this last example has been listed as missing). There is anecdotal evidence of a copy in very poor condition sold at Sotheby’s in the 1990s, but we have not been able to verify this. The map is in excellent condition for a wall map of its era. There is some occasional light creasing particularly toward the edges, as well as a few vertical abrasions in the lower area of the map produced by the nail heads on the lower roller. The title block has some very small, black paint stains, apparently offset from the upper roller. The top of the map has been reinforced on the verso with old linen, the silk edging is mostly gone, and damaged finials on the bottom rail have been replaced with finials of the same vintage. The letters quoted in this article are cited from Letters & Papers of John Singleton Copley and Henry Pelham, 1739-1776, reissued in 1970 by Kennedy Graphics, Inc. The map is described in the following sources: Boston Engineering Department, List of Maps of Boston, p. 53; Colonial Society of Massachusetts, Boston Prints and Printmakers, pp. 52-56; Krieger and Cobb, Mapping Boston, p. 185; Nebenzahl, Battle Plans of the American Revolution, #20; Phillips, List of Maps of America, p. 151; Stokes and Haskell, American Historical Prints, p. 28; Winsor, Memorial History of Boston, III:ii.